Things to do in Gilbert, Az. Gilbert is known for many things. A safe community with a family friendly atmosphere. A great place to raise children with a high quality of life. A growing community with highly rated schools. Good freeway access to Phoenix and surrounding areas. Affordable homes including waterfront and lake communities and award winning hospitals. All in all, Gilbert is one of the most desireable towns in the Phoenix valley. For a sample of some of the things that make Gilbert such a popluar community, read on. Riparian Preserve A truely unique destination in Gilbert. This 110 acre park is an integral part of Gilbert’s water conservation commitment. It provides residents a fishing lake stocked with catfish, trout, bass, and sunfish by the Arizona Game and Fish Department. In addition, there are 70 acres of recharge lakes that are home to over 200 species of birds, and 4.5 miles of trails. The recharges basins or lakes provide a Riparian habitat and also a means for Gilbert effluent water to transfer back into underground aquifers and replenish important ground water. There is an Observatory that is open to the public every Friday and Saturday night from nightfall to 9 p.m. A $3 donation is requested. To find out everything that is going on at the Riparian Preserve, to go the events calendar to classes and times. Southeast Regional Library The Maricopa County Southeast Regional library is located adjacent to the Riparian Preserve and offers the best views of any library in the state. Built in 1999, this 66,000 sq.ft. award winning library offers patrons access to internet accessible public computers and state of the art library facilities. It is located at the southeast corner of Greenfield and Guadalupe Rd. Hours are from Mon-Thurs. 10 am – 9 p.m, Friday & Saturday 10 am – 5 pm, and Sunday 1 pm – 5 pm. Hale Centre Theatre -Arizona Located in historic downtown Gilbert, the unique center stage configuration ensures that there are no bad seats. The company originally started in Glendale, California in 1947 to a meager opening night audience of 6, but it has not missed a week of presenting high quality, affordable entertainment since its humble beginning. The Hale Centre Theatre in Gilbert opened in July 2003 and has been entertaining patrons ever since. 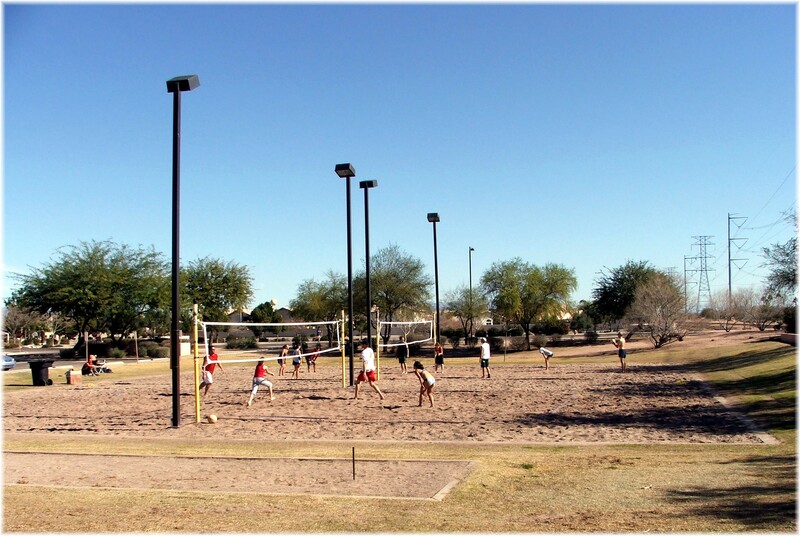 Town of Gilbert Parks – The Town of Gilbert has some of the best parks in the Phoenix valley. For a full inventory of the parks, public pools and facilities , go to Gilbert Parks. Freestone Park The largest of the Town of Gilbert Parks, Freestone provides a buffet of recreational activities. Multiple soccer fields, batting cages, 4 softball fields, tennis courts, sand volleyball courts, play areas, an amphitheatre, and a 22,000 sq.ft. skate park with features to accomodate all skill levels. The recent addition of the $6.75 million Freestone Recreation Center provides 51,000 sq.ft. of family focused fun and recreation. Within the award winning architecture building is a rock climbing wall, racquetball courts, a running track, dance & aerobics room, childcare center and weight room. McQueen Regional Park Located in the northwest park of Gilbert is McQueen Park and Recreation Center which sits on 40 acres, but only has about 500 ft. of frontage on McQueen Rd., so it’s easy to miss. McQueen Park Satellite View There are sand volleyball courts, tennis courts, softball diamonds, soccer fields, and running trails. The 27,000 sq.ft. McQueen Park Activity Center is host to a gymnasium , game room with Wii, X-box and play station systems, pool table, ping pong, foosball, air hockey, a lobby with a 51″ TV and rooms for leisure pursuit classes. There is pleny of area to hang out or go outside and walk around the 2 acre lake that is to the west of the center. Cosmo Dog Park If you have a dog, then add the Cosmo Dog Park to your list of places to visit, especially if they love to swim. Cosmo Dog Park was the winner of DOG FANCY’s Dog Park of the Year for 2007, a year after opening in July 2006. 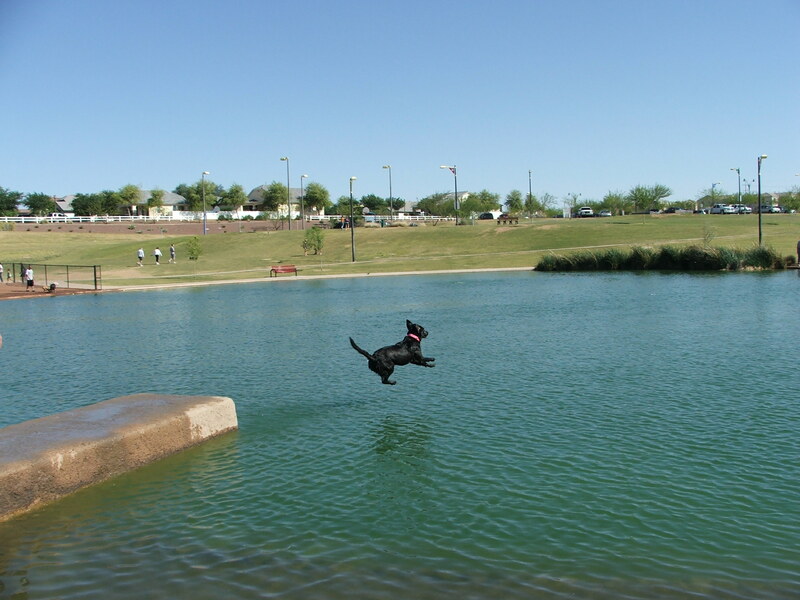 It is the only Dog Park in the Phoenix area with a lake, which many dogs thoroughly love! A detailed map shows the many amenities offered in this dog paradise. The 4 acre park provides two dog wash stations, a wet dog area, an lighted open dog park, and a timid dog area. This is in addition to the ramadas, walking trails, basketball court, restroom, picnic tables and amphitheatre. For the location check the Google Map of Cosmo Dog Park. Polar Ice Rink The 76,000 sq.ft. Polar Ice Gilbert facility was introduced to the public on Sept. 13, 2008. It is conveniently located near the 202 freeway at the north end of Crossroads Park at Greenfield and Knox. Satellite view of Polar Ice Gilbert In the development of the facility, environmental features such as low energy fluorescent lighting, skylights and a state of the art ice cooling system that cost over $120,000 have been incorporated into the design. The two rinks in the facility provide 17,000 sq.ft. of skating enjoyment. 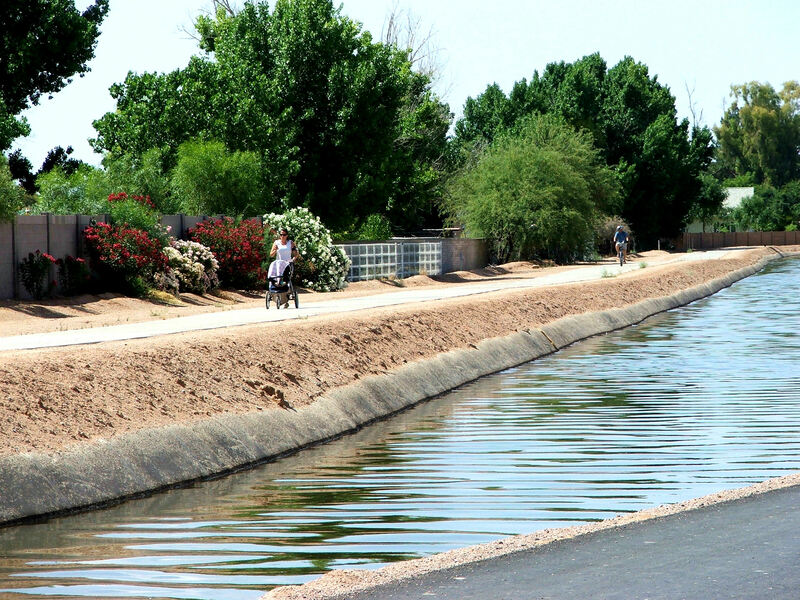 Running and Biking Trails The development of recreational paths along SRP canals has become an attractive amenity in many cities. Bikers and joggers will be most familiar with the paths since they offer a welcome alternative to narrow sidewalks, inattentive passing cars and frequent crossings at stop lights. Websites that cater to runners and joggers even calculate the mileage between beginning and ending points along different canals. Consolidated Canal Running Route or the Western Canal Mileage Calculator. In Gilbert, the Western Canal Powerline /Sun Circle Trail runs east and west, connecting Big League Dreams, the Riparian Preserve, Freestone Park and the McQueen District Park in a 8.5 mile stretch. It continues west into Chandler and also Tempe. Anyone looking for a peaceful bike ride or jog will find this trail enjoyable and with much less congestion than a street sidewalk with cars racing past at 45 miles/hour. Big League Dreams is located near Power and Elliot Rd in east Gilbert, and represents a public/private venture on 60 acres that offers a unique facility unlike anything in the state. There are eight scaled down versions of real ballparks, past and present; including Yankee Stadium, Fenway Park, Wrigley Field, Polo Grounds, Ebbets Field, Angel Stadium, Sportman’s Park, and to appease the local crowd, Chase Field. Each ballpark has seating for 190 spectators. There are two clubhouses that provide food and beverages. Once you see the prices for the soda pop, you’ll make a quick note to fill up the cooler the next visit. Besides softball leagues, there is also an indoor soccer complex that is well utilized. Joe’s Real Barbeque One of my favorite restaurants in the center of downtown Gilbert. Joe’s opened for business in January 1998 and has been satisfying cravings for barbeque brisket, pulled pork, pit ham, pork ribs, chicken and turkey breast ever since. The food is award winning and you’ll also appreciate the old-style atmosphere that is one of a kind. Where else will you find a 1948 John Deere tractor in the middle of the dining area? The New Times awarded Joe’s the Best of Phoenix for Old-Fashioned Charm. If you are into sauces, you have your choice of spicy, or “we dare you” hot which uses habanero peppers to turn up the heat. My favorite lunch time meal is the BBQ sampler with over 3/4 lb. of ribs, chicken, pork and beef. Most plates are in the $8 – $12 range. What more can I say, you have to try it! 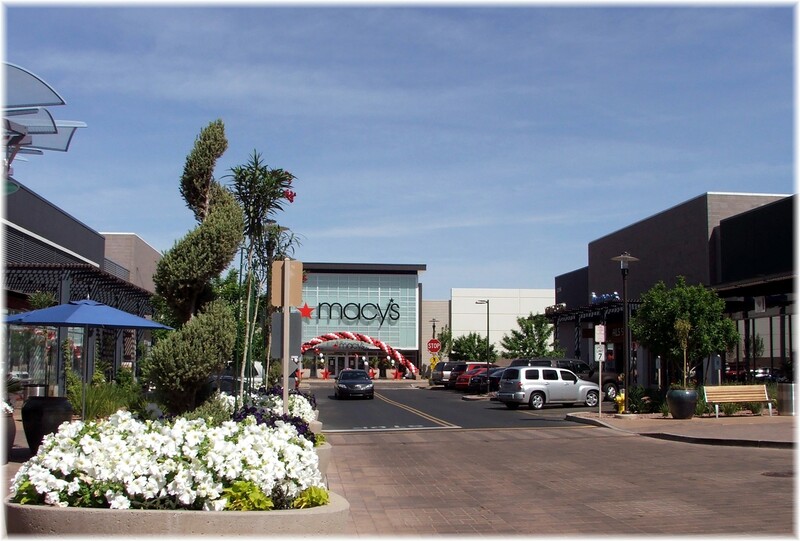 San Tan Village Outdoor Shopping Center San Tan Village located at Williams Field and the Santan 202 freeway is comprised of two sections; the shopping center and the urban village. For a layout of both click on San Tan Village Shopping Center layout. The list of stores is almost endless as seen in the Story Directory The layout of the the urban village is nothing new, but the uncommon outdoor layout for the shopping center is a unique twist, especially for Phoenix when outdoors in the summer is synonymous with 110 degree days. That misting system better work! Places to eat include Paradise Bakery & Cafe, Johnny Rockets, Famous Dave’s, Blue Wasabi Sushi & Martini Bar, Cantina Laredo and the Kona Grill among others. 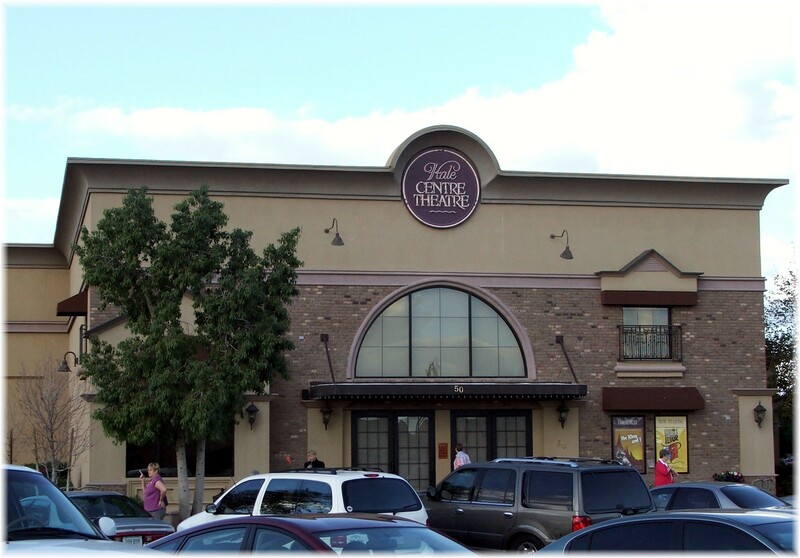 After a relaxing dinner, the Harkins Theatres complex is just a short walk away. 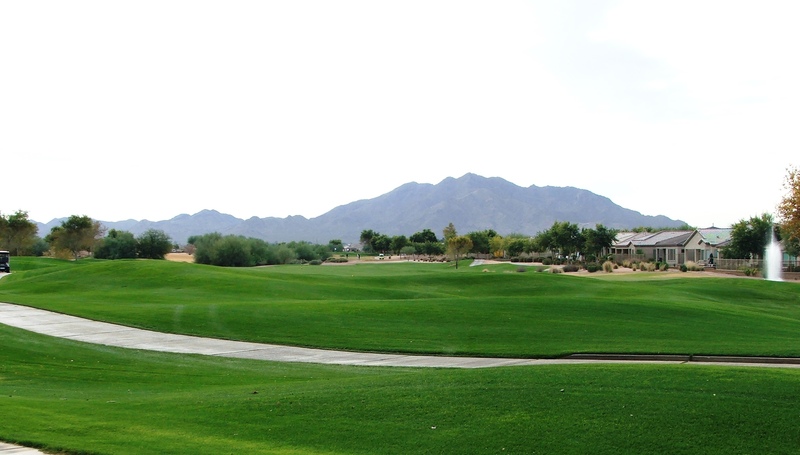 Golf Courses – Gilbert is home to 5 golf courses; Kokopelli, Trilogy, Western Skies, Seville Country Club, and Greenfield Lakes. All are public course except for Seville. A golfing friend of mine ranks Trilogy as the best in Gilbert. As you can see, Gilbert has a lot of offer its residents and neighbors. Feel free to comment on some of the activities or attractions that you enjoy in Gilbert. Gilbert also provides some of the best real estate options in Arizona. For assistance with real estate needs, feel free to sign up for Gilbert Real Estate listings. Or if you live in Gilbert and want to know the value of your home. 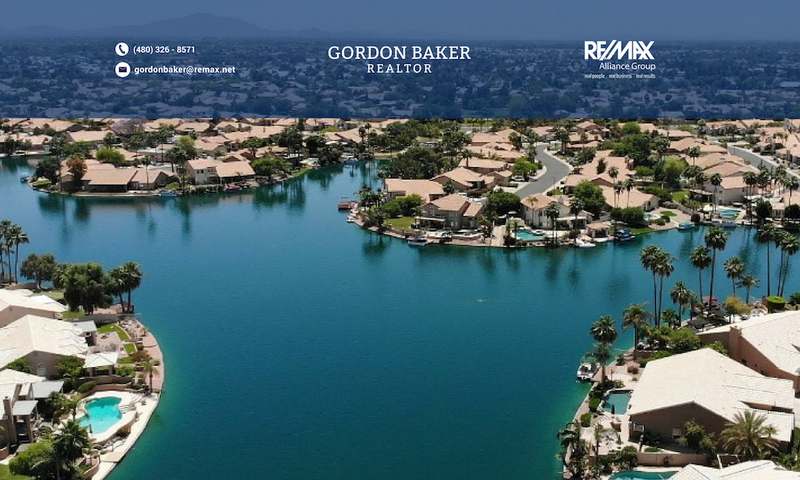 To search for homes visit, Gilbert Real Estate.